We thoroughly enjoyed our stay here. The accommodation is so comfortable and welcoming. I’m sure we’ll be back (to race the horses or otherwise). We had a wonderful time and loved our stay here. Thanks to Bob and Debs for being so welcoming. See you again! Pretty perfect! Absolutely fabulous place to stay. Love all of the little extras, fresh bars of soap, ladies toiletries – everything has been thought of to make it really special. I love the flexibility of self catering, but also having a top notch breakfast laid out. Didn’t want to leave. We’ll definitely be back. 10/10. Coming back to fresh cream scones was a delightful treat. Thank you so much! I’ve had a great birthday weekend. It’s worth staying for the bath alone!! SPLENDID! Great place to R&R. This has been a wonderful break! 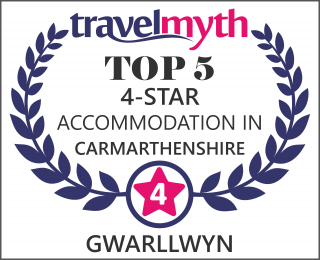 Gwarllwyn is a very special place run by two very special people. We have loved everything! The annex is fabulous, comfortable, spacious and bright. The only problem with breakfast is deciding what to have – so much choice and all delicious, especially the eggs!! The animals are great, the views wonderful and the surrounding countryside is very beautiful. A great deal of time, thought and hard work has gone into creating this little sanctuary and continues to do so. Thank you both so much. Can’t wait until I return in July! Thank you for making us feel so welcome. You have thought of everything to make our stay so pleasant and enjoyable. Freddie enjoyed himself too. Dear Debs & Bob. Thank you so much for these fabulous days in your lovely home. We are the first time in Wales and are very happy to find this paradise. We feel like the royals, we got so much good feelings and absolutely great breakfast and cakes. The kids loved to stay so close to the animals. All the best to you!